ABOARD THE AmaDAGIO – Again we departed in the wee hours—in time to arrive in Avignon around breakfast-time, and to commence our shore excursions. One of the things that attracted us to this cruise, in addition to the wine theme and the itinerary, was that all shore excursions were included in the price. A decision we often faced—which excursion? 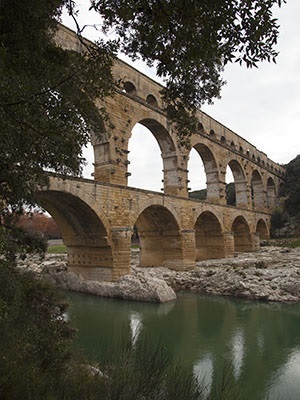 In Avignon, in lieu of a walking tour of the city and the Pope’s Palace, we opted for a visit to Pont du Gard, the iconic, 2000-year-old Roman aqueduct. It’s a sight we had missed on our previous visits to France, and we weren’t going to let that happen again. A true engineering marvel, the Pont is actually a multi-tiered, arched bridge that carried the aqueduct over the River Gard. The aqueduct traversed about 35 miles from a fresh water spring in the village of Uzes, to the bustling Roman City of Nimes, a straight-line distance of a little over 20 miles. The gradient over the entire distance is 1 foot per mile. The aqueduct served its intended function for 700 years, and the bridge survives to remind us of its builders’ prowess. It’s also a photographer’s delight. It was market day in Uzes, a sizable, bustling stone village that our British-accented tour guide said was very popular with ex-pats from her home country. 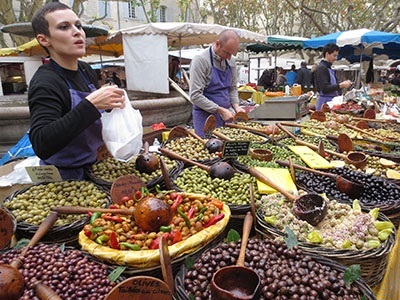 The place seemed French enough for us as we wandered among food and arts & crafts vendors, picking-up a few small gifts and a huge and delicious slice of pizza with blue cheese and black olives. We returned to AmaDiagio in time for lunch and our afternoon tour of the Chateauneuf-du-Pape appellation. We got a close-up view of some of these extraordinary vineyards that seem to be growing out of a field of stones. The area is indeed home to some very rocky limestone soil, but it turns out that viticulturists here don’t think that’s enough, so they bring in more stones to literally cover the soil. We were told that the stones’ ability to absorb the sun’s heat during the day and release it slowly at night helped to moderate temperature swings thus benefiting the vines. An opportunity to sample the fruit of those vines was provided by the tasting room of Jerome Quiot in the village of Chateauneuf-du-Pape. Here, the lovely Bellina gave us a tour of the facility where the grapes are crushed, fermented, aged and bottled before pouring us all samples of the final products. She explained the 13 varieties of grapes that are traditionally planted in the appellation and then poured a 2013 vintage white, the first white Chateauneuf-du-Pape that most of us had ever tasted. Bellina explained that white grape varieties amounted to only 5% of their production and that very little of that was exported. We then got to compare two red wines, the 2011 cuvee traditional, a field blend of all 13 varieties planted together in the vineyard, and a 2006 cuvee exceptionnelle, a blend of Grenache and Syrah. 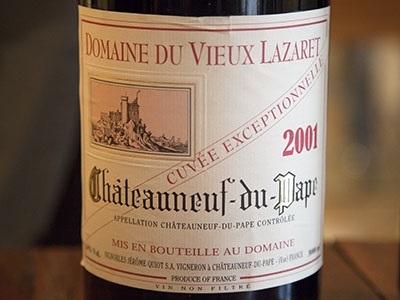 The former was a lighter and fruitier wine, the latter more full-bodied with earthier aromas and flavors complimenting the fruit. We enjoyed them all, but the cuvee exceptionnelle proved our personal favorite. Our evening meal featured a “Chaine des Rotisseurs” dinner, showcasing the talents of the culinary staff aboard and serving dishes that helped the cruise line to be the only one to be admitted to the prestigious organization of chefs and restaurateurs. We concluded a very full and rewarding day by listening in the lounge to “Les Guitars des Camargues,” a flamenco-style guitar and dance group. Crossing the ocean on a sailing ship: Is It For You?